On our way from Kaoshiung to Kenting, we were a little hungry and decided to look for a snack. We turned off the main road toward an area that had a few restaurants according to Open Street Map. Quite randomly, there was a temple at the end of the street. 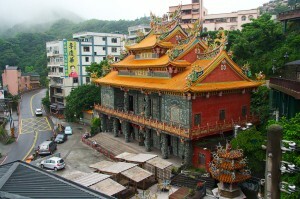 (Truthfully, that’s not so random for Taiwan – it seems like there’s a temple on every street.) Serendipitously, they were having some kind of celebration. There were fireworks, parades and a small market with food vendors. Even better, there was a show. The costumes were awesome. Just up the street, there was this colorful shop selling articles for prayer rituals. 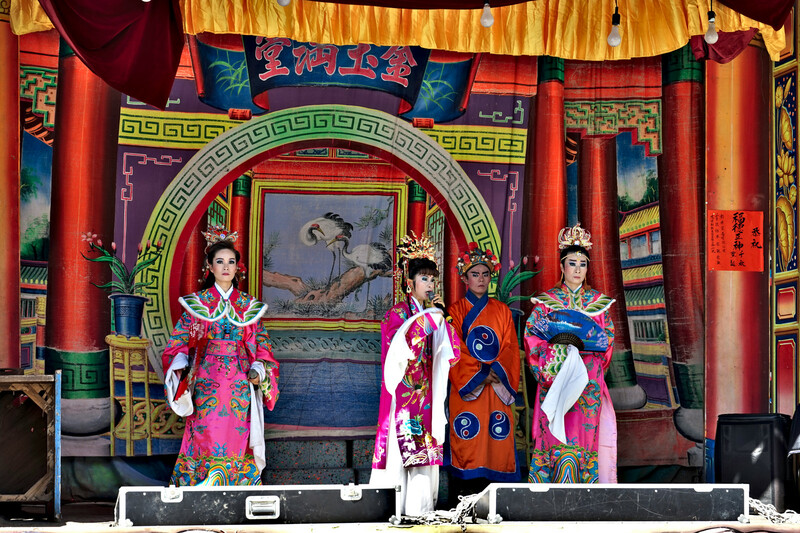 One of the reasons we love to travel is to learn about other cultures and traditions. Even though I’m familiar with Judeo-Christian rituals, I could not imagine what worshippers were doing in the Dianji Temple in Keelung, Taiwan. Outside the temple, I watched people put stacks of paper, folded, one page at a time, into a furnace. Why a whole stack? Why one page at a time? And why folded in a certain way? Inside, I saw a few people throwing red crescent-shaped wooden blocks onto the ground. Others were drawing sticks from what looked like an umbrella stand. All this activity was in addition to the expected praying and lighting of incense. Fortunately, this mystery of rituals was explained by our Taiwanese friends Elizabeth and Phillip. We met them on our cruise and became friends. Lucky for us, we happened to bump into them in the Miaokou Night Market just before we arrived at the Temple. The people throwing blocks were posing a pressing ‘yes’ or ‘no’ question to the gods. If the blocks landed one flat side up, one flat side down, then ‘yes’ was the answer to their question. If both curved sides landed up, then a resounding ‘No’ was the answer. If both flat sides landed up, then the gods were uncommitted and the answer to your own question was left up to you. As for the sticks chosen from the umbrella stand, they were fortune-telling sticks. A hidden mark on the bottom of the stick directs the worshipper to their written fortune in a specific marked drawer in an adjacent chest of many drawers. If they don’t fully understand or perhaps don’t believe what they read, then they can take the slip to an interpreter in the Temple. There are several waiting by but I didn’t learn if they were monks or trained lay people. 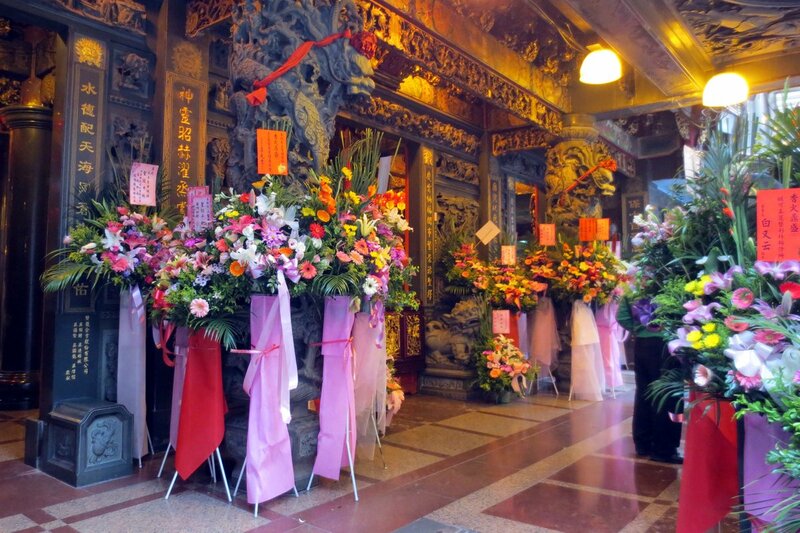 We noticed that Taiwanese Temples had furnaces just outside the gates for paper offerings. Offerings were made for health, prosperity and to petition for almost anything imaginable. In addition to praying for themselves, offerings are also made for their ancestors. 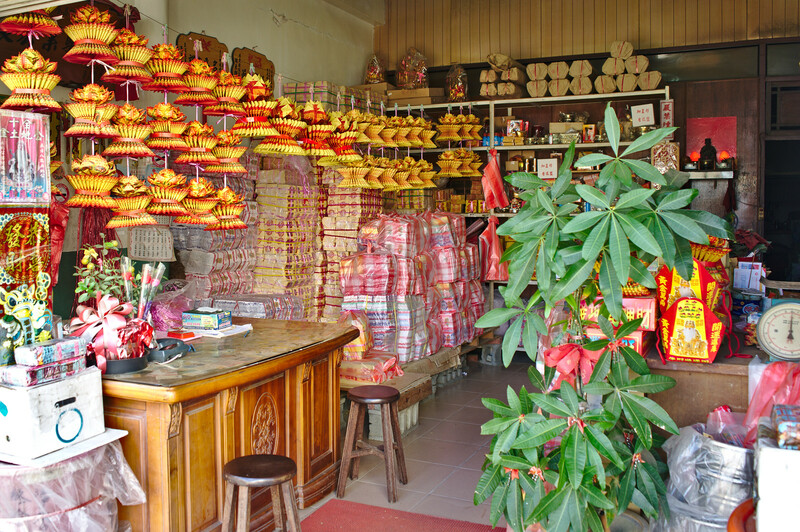 It is believed that the paper money offerings are sent to heaven for their ancestors. 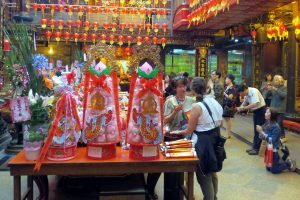 This ensures their ancestors’ continued well-being in the after-life and enables the ancestors to purchase necessities and even luxuries for their comfort. 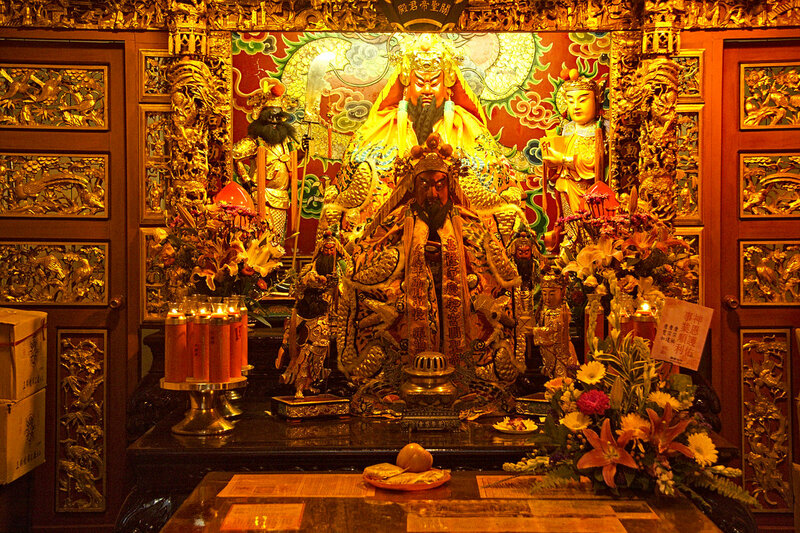 Worshipping their ancestors also ensures their positive disposition towards the living. It is believed that the spirits of the dead continue to live in the natural world and have the power to influence the fate and fortune of those living. We were told that if someone wished for an iPad, for example, either for themselves or for their ancestors, they would design a paper version of an iPad and include it in the package of other papers that they folded and placed into the furnaces. The downside of burning offerings is the huge amount of carbon pollution. Lavish amounts of papers tend to be burned to make sure that offerings are well received. During the 7th month of the lunar calendar, called ‘Ghost” month, there is a tremendous increase in paper burning. In an effort to reduce carbon emissions, bakeries in Tainan City came up with an out-of-the-box alternative. They make layered mango cakes that look just like a stack of paper money. Tainan City was the capital of Taiwan during imperial times and is still considered to be the cradle of Taiwanese development. 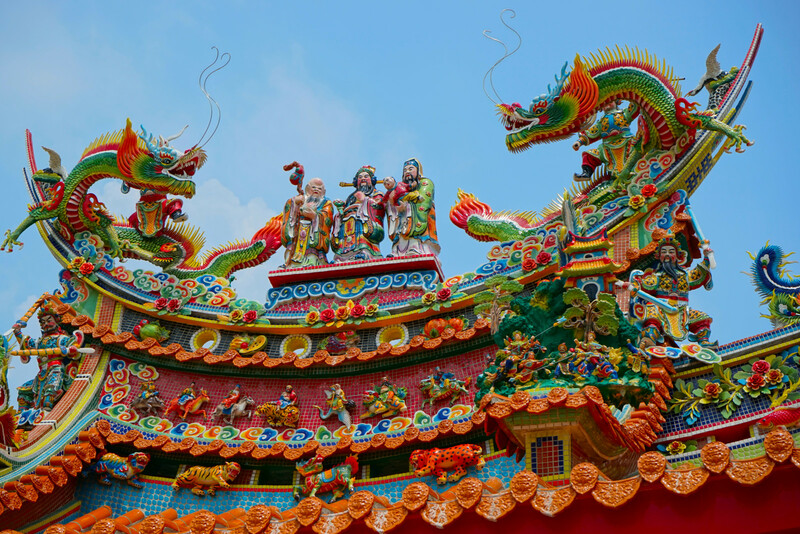 It boasts almost 2,000 temples. I think it’s quite befitting that Tainan City, the oldest city in Taiwan, try to initiate a new eco-friendly, albeit highly untraditional alternative, to an ancient tradition.